It might not be Thursday when you’re reading this but, I definitely want to take the time to talk about just how wonderfully captivating Dark Horse’s; Critical Role: Vox Machina Origins truly is. Inspired by “Geek & Sundry’s long running and incredibly popular Dungeons & Dragons live play show called Critical Role featuring the talented cast of Dungeon Master/Voice Actor Matthew Mercer and voice actors; Laura Bailey, Marisha Ray, Ashley Johnson, Travis Willingham, Sam Riegel, Liam O’Brien & Taliesin Jaffe,” it’s an absolute joy to read from cover to cover whether you’re a fan of the series or not. Moving from page to page, it becomes clear that this six issue collection is an actual labor of love for the fans of the series and newcomers alike rather than just content produced to make a profit. Released on May 31st 2018, the six issue volume is a product of the creative team of Matthew Colville, Mathew Mercer, Olivia Samson, Chris Kawagiwa, Chris Northrop, Stjepan Sejic, Travis Ames & Cassie Anderson. Together, this team of writers and artists rises to the challenge of capturing the magic that has made Critical Role the phenomenon that it is today having spanned “over 100 episodes, inspired countless works of beautiful art, and convinced thousands of people to at least give Dungeons & Dragons a chance.” Even when faced with so much source material to draw from and an already well established fan base, the talented team of writers and artists sought to make this book accessible for newcomers by framing the overall series as an Origins story. The 160 page offering wastes no time with introducing you to the party of Vox Machina with the first page serving as a three panel snapshot that illustrates the transformation that Vox Machina underwent on their journey from people thrown together by circumstance to heroes of legend. It’s actually within this first page that the unique tone and humor conveyed through the combination of Colville’s writing and Samson’s detailed artwork is put onto full display serving as a small tease of what’s to come through subtle changes in color palette and panel layout. Moving past the simplistic yet impactful snapshot pages, the rest of the series is absolutely no slouch when it comes to creating dynamic scenes, shocking moments, and presenting a narrative that is very much high fantasy at its core. While reading through the series, Colville’s implementation of the clichés and archetypes associated with fantasy literature becomes apparent in his characterization of the members of Vox Machina. At first glance, it’s true that the protagonists of the series are the archetypical fantasy party with their composition of cunning rogues, the fast talking bard, the moronic barbarian, and even the pompous sorcerer making up the central cast. Interestingly enough, Colville does not allow these archetypes to detract from his characterization as the dialogue that he presents for each character gives them their own unique voice. Colville’s characterization through dialogue and interaction really allows each member of Vox Machina to break their archetypical mold while fleshing them out as individuals with ties to the people and world that surrounds them. Across the entirety of the series, Colville doesn’t let any opportunity slip by for character development, whether it be the sibling banter between Vex and Vax, Scanlan’s instances of humorous self-awareness or Keyleth and Tiberius’ naivety during social interactions which all serve to make the characters both realistic and relatable. Centered on a curse that is plaguing the town of Stilben, Samson and Colville’s talents come together to set the tone beautifully showing just how the denizens of this coastal city are being tormented in a series of panels that showcase Samson’s ability to convey emotions through detailed facial expressions. 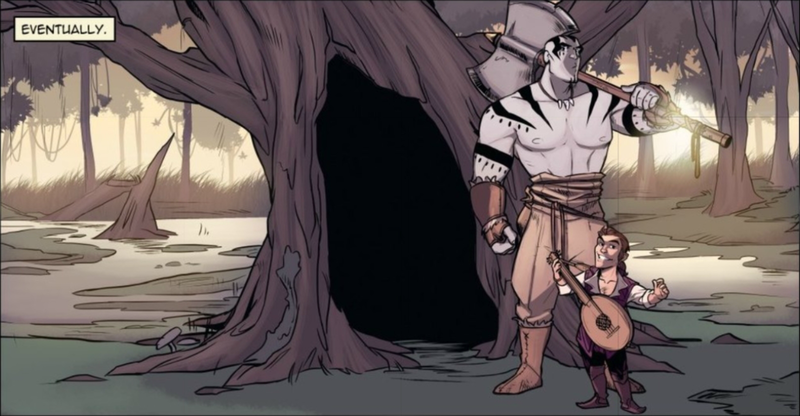 Samson’s ability to convey the different emotions that each character is experiencing at any given moment is a talent that is exhibited throughout the entirety of the six issue series and when coupled together with Colville’s impactful writing makes you truly feel like you’re right alongside the members of Vox Machina on their adventures through Stilben’s swampy marshlands, harbor district, and even an ancient temple. The combination of Samson’s artistic ability to capture and convey coupled together with Colville’s delivery result in some of the most phenomenally written and illustrated scenes I’ve seen this year while still moving the story along. Ultimately, Critical Role: Vox Machina Origins is an absolutely delightful series to experience and read from cover to cover. The results of the collaboration between Dark Horse, Critical Role, and the creative team spearheading the project is something that comic book fans as a whole can enjoy while providing plenty of Easter eggs for fans of the series to enjoy. Moreover, the attention to detail and care that was taken in bringing such beloved characters to life while still telling an original story is something that should be applauded and praised as an absolute critical success. So, why not go for an adventure alongside Vox Machina? One Punch Man Season 2 Announced!